Cryo-Cube is the most rugged and versatile line of reusable Thermal Insulated Cold Box available in the industry today. The shipper is designed to meet the economic challenges of closed loop shipping lanes while promoting ease of use and minimal packaging. 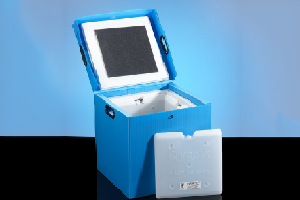 The Cryo-Cube range exists in two versions : one version in VIP for temperature performance up to 144h, one version in polyurethane panels for shipments up to 96h and one version in polystyrene panels up to 48h. Cryo-Cube can be used with the Phase 5 panels for 2°-8°C applications which is already pre-qualified or with the Phase 22 panels for 15°-25°C applications.